Leuven/Louvain, batiments universitaires, l'héritage de six siècles au sein du centre historique is part of the Tentative list of Belgium in order to qualify for inclusion in the World Heritage List. A short trip from Brussels by car or train. Interesting university city but does not deserve WHS status IMHO. Whilst I am not sure if Leuven would add much to a World Heritage list that is already pretty full of nice European cities, this university town really has a lot to reward visitors. My fond memories owe a lot to the fact that I have made some great friends at the university, which is a really great seat of European learning. Even if you do not know students here the university is a very important part of the city. Many of its buildings are architectural highlights, especially the library. Secondly, and somewhat intangibly, the large amount of students give this city a great atmosphere. The architectural highlight of the city is the Stadthuis, on the Groot Markt, which has to stand as one of the highlights of secular Gothic architecture. Its masses of statues and flags are really quite exceptional. Alkso on the square is one of the already inscribed Belfries. The wonderful Oude Markt is just around the corner and really is beautiful, and full to bursting point with bars and cafes. Those that have been to Belgium would probably know of its Beer culture, nowhere is this better expressed than in Leuven. The large InBev Brewery on the outskirts is perhaps the most famous, but the great Domus brewery-pub is one of my favourites. 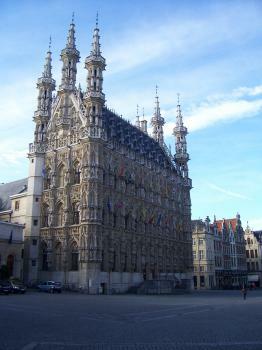 I really love Leuven but I am not sure if it would really add much to the World Heritage List, there are plenty of well preserved medium sized European cities on the list already. However I would thoroughly recommend a visit to see the magnificent Stadhuis as well as the best of Flanders� Begijnhoofs. One of my favourite European towns, it already has two sites inscribed on the list which is more than enough to warrant a visit.